As part of the $1 billion initiative lead by Obama and Biden, the Cancer Moonshot Task Force was created in an effort to jumpstart work being done to eliminate cancer. In Summer of 2016, there was a national day of action entitled the Cancer Moonshot Summit in which groups of scientists, patients, families, and policy makers joined together in 270 different locations in order to collaborate. 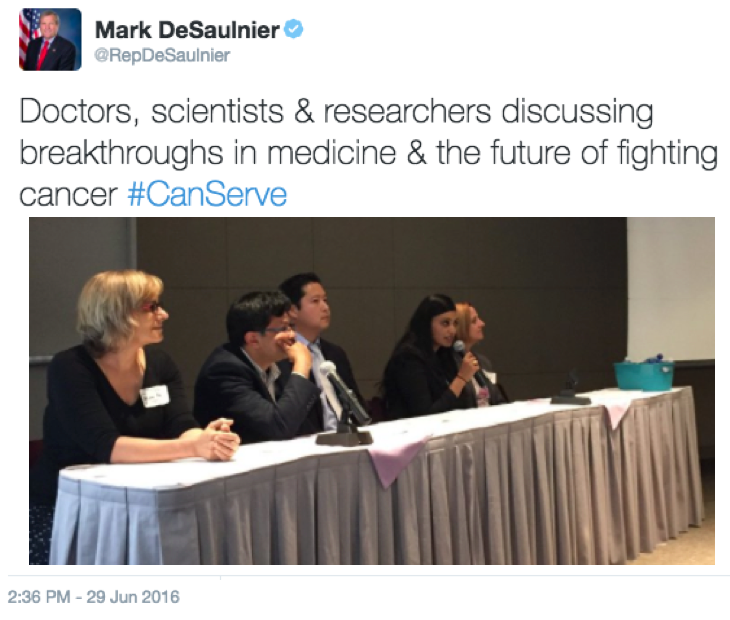 State Representative Mark DeSaulnier hosted one of these gatherings at John Muir Medical in which several doctors, scientists surgeons, and cancer survivors met together. CEO Ambika Bumb was chosen to be a on a panel with a few other scientists and doctors in order to discuss the next step in cancer research and diagnostics. She discussed the importance of early detection of cancer, and received questions and support from the audience and community members. Representative DeSaulnier, a cancer survivor, personally congratulated Bikanta on their efforts thus far and tweeted about the event with a picture of Ambika speaking on the panel. The event was also covered by the Berkeley Labs. CEO Ambika Bumb with Congressman DeSaulnier at the Moonshot Summit in Concord, CA.